With interactive exhibits, plus an extensive selection of memorabilia and machines used in the D-Day landings, the National WWII Museum offers a fascinating insight into the USA’s role in the Second World War. Learn all about the planning that went into the landings and see what life was like for the men and women involved in the war. Opened in 2000, and originally called the National D-Day Museum, the National WWII Museum takes an immersive look at wartime life and the input the United States Armed Forces had in the Allied victory. Visitors have the chance to dine in 1940s style at BB’s Stage Door Canteen, see restored fighter planes and tanks, and even experience a thrilling ride on Lake Pontchartrain onboard a restored PT boat, the same type of craft that was used in the Normandy landings. If you’re touring independently, prebook admission so you can skip the line upon arrival. For an extended day trip, you can combine a visit to the museum with a citywide private tour that includes air-conditioned transport. Discounted admission tickets are available for children, seniors, students, and military personnel; WWII veterans can visit for free. The museum is very large, so plan the exhibits you want to see ahead of time to get the most out of your visit. 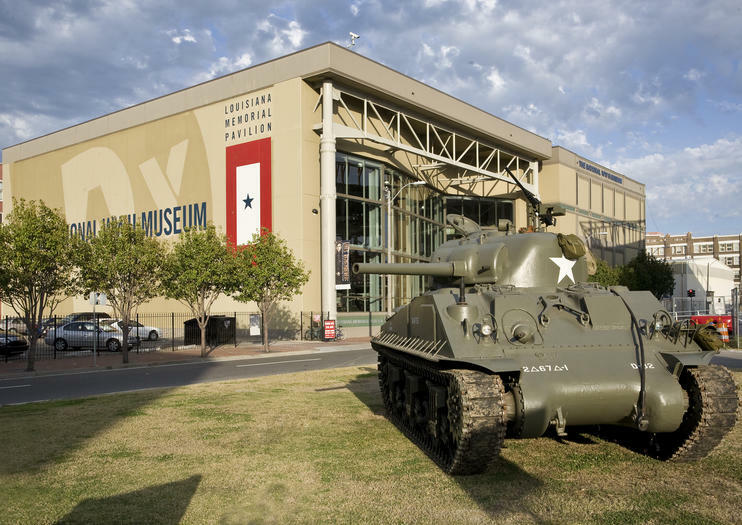 The National WWII Museum is located at 945 Magazine Street in New Orleans’ Warehouse District, just off Lee Circle. The historic St. Charles streetcar (Line 12) runs in front of the museum—the closest stop is Lee Circle. Paid parking is available on-site. Alternatively, you can visit the museum as part of a private city tour that includes transfers to and from your accommodation. The museum is open every day from 9am–5pm, except for Mardi Gras, Thanksgiving, Christmas Eve, and Christmas Day. The museum is busiest in the early afternoon, so plan to get there early to have plenty of space to explore. Start off your day in the “Big Easy” with a New Orleans-style jazz brunch in one of the city’s famous restaurants. You’ll enjoy traditional Creole dishes, such as shrimp étouffée and jambalaya, while local musicians serenade you with toe-tapping tunes. You can prebook your brunch experience ahead of time for the best prices and the best tables.